Examples of integrated performance assessment units can be used or adapted to fit your classroom. ESSENTIAL QUESTION: How do clothes tell a story? Read descriptions of several people in a teen magazine from the target culture. Now, match the descriptions to the pictures of the people. After you complete the matching, decide which person you would like to meet and why. Prepare to give specific reasons for your choice. This task is interpretive because the students read the descriptions in the target language and match the descriptions to pictures of the people described. The students do not have to produce answers in the target language. The assessment is focused on understanding. This is a springboard for a rich discussion of clothing/appearance as a reflection of personality that can be in English to allow students to express ideas for which they may not have the target language. The discussion provides a connection to topics related to other subject areas such as sociology, psychology, history, economics, social studies and others. Can a student accurately predict what a student from another country is like based on his/her clothing/appearance by using criteria related to American teenage dress/appearance? Here also, it is appropriate for an in-depth discussion to be in English. To prepare for the presentational and interpersonal tasks, students come to school dressed in a way that they would not normally dress: for example, a conservative dresser might come to school with hair dyed, a nose ring, wearing all black. Write a three-paragraph essay: Clothes Tell a Story, reflecting on your experiences wearing a different style of clothing. In paragraph one, explain what you wore and why you chose this outfit. In paragraph two, summarize how people reacted to your new look. In paragraph three, discuss what you learned from the experience. Do clothes tell a story? This task is presentational because the students are writing formal essays. The evening after the dress-up day in school, students will simply answer three questions in the target language: What did others say? What did others do? How did you feel? What did other students say? * Students’ responses may contain errors since the responses to the questions have not been reviewed by the instructor at this point. This is the brainstorming phase of the writing assignment. Students will bring their responses to school to do the Interpersonal task explained below. With the added information from the Interpersonal task, students can now write a rough draft for their essay. After the rough draft is completed, the student receives feedback from the teacher and peers. It is recommended that peers be given very specific tasks to accomplish in terms of feedback, and to be held accountable for their feedback. For example, a peer could check for adjective agreement or correct genders, or that no words were left in English. Peers could verify that the contents of the three paragraphs matched the instructions. To simplify this process, give peers a short checklist (two or three items) to use in providing feedback. They can complete the checklist, write their comments and sign their name to the checklist indicating that they have given appropriate feedback. The teacher must remember that he/she is not writing the essay for the student. Before accepting a rough draft, give the students a list of non-negotiables. Non-negotiables are items for which students can take complete responsibility. Rough drafts should not be accepted unless the non-negotiables have been met. For example, in this essay a non-negotiable would be three paragraphs addressing the topics outlined in the instructions. A non-negotiable might be how many sentences must be in each paragraph as a minimum. A non-negotiable might be that no English can be left in the draft. Or, a non-negotiable might be correct spelling. By outlining three to five items that the student can control, the draft will be of higher quality and the feedback can focus on clarity of the communication in both structure and content. The Interpersonal task takes place the day after the students have dressed in a different style, and after they have had the evening to reflect on the experience. They are bringing to class their notes on the experience (refer to the presentational task for these notes). Students will share their thoughts about why they were treated the same or differently in school. They will also discuss why they felt the way they did. Finally, they will discuss how clothing influences people’s impressions of one another. This is interpersonal because it is spontaneous. Yes, they are bringing some notes to class that they prepared at home. But these notes are preparation for the discussion. The discussion does not ask the same questions that the students answered at home. The discussion is an extension of these questions. The discussion is compelling because it is based on personal experience on a topic that is of great interest to teenagers. The reflection completed at home gives the students a basis for participating in the discussion. In assessing the students during the Interpersonal task, a teacher can choose to have students assess the discussion group, and their personal participation. The discussion could also be videotaped for the teacher to view later. Or, the teacher may move among the groups to get a general impression of the discussion in each group. The teacher may also choose to pull one or two students aside and discuss the topics with these students in detail. The interrelatedness of the three modes of communication for this unit gives the students multiple opportunities to use the language related to the unit theme and multiple and rich opportunities to communicate. 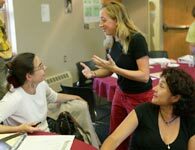 In addition, the connections students make to other subject areas they study and the cultural comparisons they make, both with the culture of the target language and their own, provide the connections that make language meaningful for students. See more examples of complete standards-based integrated performance assessment units.